These unique boots are made with silicone gel technology that is bespoke to Just Togs. Height 42cm / Calf Width 41cm. Square toe design. Condition is Used. Really comfortable and solid, Full zip up the back. One zip pull broke but it has been replaced by a ring as shown in the photograph. It is not noticeable when the boot is fully zipped and closed. 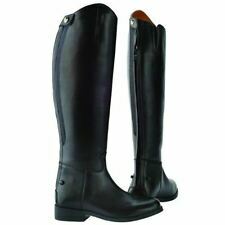 REGENT Black Leather Riding Boots Size UK 7 - Made in England. Condition is Used. Quality used Regent riding boots. Used, not new, worn as seen. Some wear but no major defects noted. Honest and genuine quality used riding boots with boot pulls and boot trees. Sold as seen, check photos. Free UK delivery. Check out my other items. Moretta Long Black Lether riding Botts Size 7 In Excellant Codition. Condition is Used. Dispatched with eBay delivery – Shutl 2-3 days. They are very comfortable with the famous ariat ATS footbed providing stability and comfort and cushioning the foot. This has been shown to reduce fatigue to the feet lower legs and back. A great opportunity to buy a pair of these versatile boots at a bargain price - RRP for these is £269.99. Shires ladies riding boots, tried on just been sat in storage since bought them as they are too big. Condition is Used. This stylish tall boot is made from soft premium selected full grain leather that has a beautiful shine and finish. The footbed features a ShockX Advanced Insole for enhanced comfort with a Prolaze Stretch-Flexnotch for a softer and easier heels down position. > Ariat® 4LR® technology with flexible, cushioned EVA footbed and sturdy Duratread™ outer. Handcrafted from premium full-grain leather with a high Spanish-cut top line and full leather lining. The boots combine style, grace and performance and feature a contoured ankle design and tighter fit system which provides a svelte fit and silhouette. Black riding boots size 7 in very good condition . Condition is Used. Dispatched with Royal Mail 2nd Class. ARIAT GLACIER riding boots size 7 - excellent ! 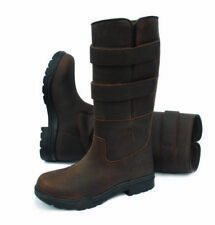 This is a fabulous pair of ARIAT GLACIER boots size 7 uk in brown which are waterproof, insulated and the ultimate in riding/country footwear. They are very comfortable with the famous ariat ATS footbed providing stability and comfort and cushioning the foot. Equi theme Long leather riding boots size 7. In excellent condition Only worn at a couple of shows Comes with William funnel boot bag Dispatched with Royal Mail 2nd Class. An elegant allround and jumping leather riding boot with elastic shoelace and decorative trimming at the top. Made of soft nappa leather with breathable leather lining. With long zipper at the back to the floor for an easily putting on and off. Old Mill Race Exercise Boots. Condition is Used. Dispatched with Royal Mail 1st Class. For sale as I have decided I prefer short yard boots. Brand new fuller Fillies field boots. Unfortunately to small for me. Size 7 lo/MW. These super smart long leather boots make the ideal country to town winter footwear. All Terrain Soles with steel shanks.